The ancient root herb has seeped into skincare. We add ginger to tea to soothe our stomachs and toss it in a wok to enhance the flavors of a dish, but this Asian staple shouldn’t be confined to your pantry. The brilliant natural ingredient has serious anti-inflammatory, antinausea, and antihistamine benefits, but the leggy root has yet to take that long walk out of the kitchen and into the bathroom—until now. 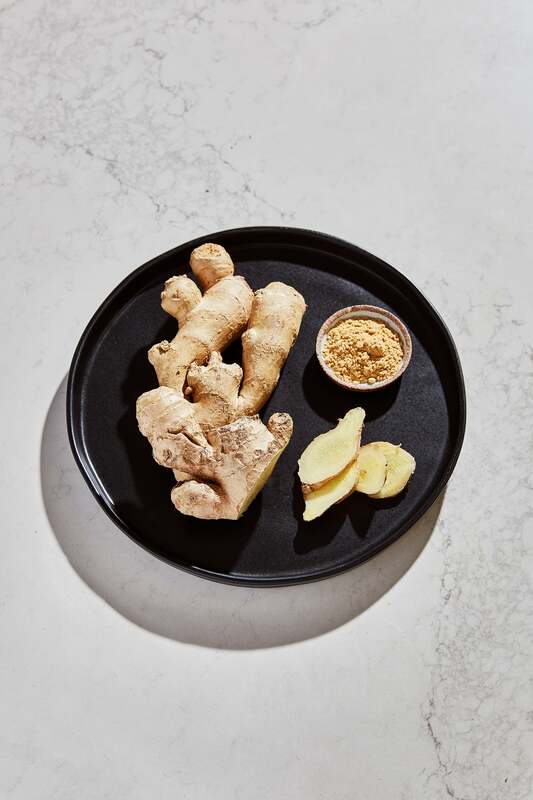 The ancient medicinal staple has been given a second life—from skincare to hair remedies to body oils, ginger is practically trending. Just this year, the magical ingredient has seen a huge increase in searches on Pinterest. From ginger water (up 353 percent) for soothing inflammation to ginger oil (up 659 percent) for bath oils, the humble ingredient is proving to be one of the most underutilized in our beauty and wellness routines. From head to toe, here are some clever ways to use ginger. Ginger can be a potential aid in fighting migraines and the painful side effects of nausea and vomiting. In one small study, researchers looked at ginger’s effect on migraines, and they discovered the average migraine duration significantly decreased in participants who consumed ginger powder. More studies need to be done to before it can be confirmed as a truly effective tool, but researchers recommend utilizing ginger as a healing option in all its forms, including ground ginger root, powder, tablets, capsules, tea, and essential oils. Externally, ginger can be incredibly effective on the head, when it comes to hair health and growth. Fresh ginger contains a plethora of powerful minerals and vitamins—like potassium, magnesium, and fatty acids—all in which can make hair stronger, shinier, and healthier. Peel and grate a fresh root, and then rub the thick paste on the scalp, specifically in thinning areas, letting it sit for 30 minutes three times a week. Ginger probably isn’t the first natural remedy you’d consider when it comes to skincare. It turns out that we’ve been underestimating that root yet again. “We predict that ginger in skincare will be huge in 2019 and a holy-grail ingredient for hyperpigmentation,” says Christine Chang, cofounder and co-CEO of Glow Recipe and Sweet Chef. “Ginger root extract is an amazing skincare ingredient that neutralizes environmental stressors and revives dull skin,” says Sarah Lee, cofounder and co-CEO of Glow Recipe and Sweet Chef. The brand-new line is banking on ginger’s powers so much that of the three new antioxidant-rich, ingredient-based lines at Sweet Chef, one is entirely dedicated to ginger. Available in a Ginger and Vitamin C Serum, $19.99, and a Fresh Pressed Sheet Mask, $3.50, these two ginger-based products are focused on brightening, fighting environmental aggressors, and reviving dull skin. The line launches on glowrecipe.com in mid-January and will be in Target stores at the end of the month. Ginger-based body oil can soothe sore muscles and achy joints. Ginger’s antioxidants, anti-inflammatory benefits, and antibacterial properties can also heal and revive. Try out Naturopathica Ginger Root Bath and Body Oil, $34, which warms and soothes with a blend of ginger and lemongrass essential oils. The robust oil is perfect to be massaged on after a workout or strenuous activity (yes, simply going outside in the winter counts as “strenuous”). Bonus points if you’re able to take a bath in the oil before massaging it on afterward. We promised head-to-toe ginger application, and we’re true to our word, people. Soak those hard-working feet in a potently healing ginger foot bath. Bring a large saucepan of water (enough to cover feet, ideally 10 cups) to boil, add a handful of fresh peppermint and thyme leaves and freshly chopped ginger (ideally one medium-size piece around two inches long) and simmer for a few minutes. Take off the heat and let herbs and ginger infuse the water for two hours. Strain the ingredients and let your feet soak for 20 minutes. Honestly, is there anything ginger can’t do?